This registration type is for up to three guests for each of the inductees of the Class of 2019 into the Bluegrass Business Analysis Hall of Fame. The Bluegrass IIBA Chapter will host its Annual General Meeting (AGM) and induct the fourth class of professionals into the Bluegrass Business Analysis Hall of Fame (BBAHoF). The AGM will look at what the Chapter has accomplished in the past year in relation to its strategic plan, its community outreach efforts, relationships it has built and inform participants of the strategic plan for the coming year. There are transformational changes happening in the global business analysis community, we will look at how the Bluegrass IIBA Chapter will bring those changes to the Bluegrass business analysis community. The Bluegrass Business Analysis Hall of Fame recognizes those from the community that have made a significant individual contribution to the advancement of business analysis as a profession within the Bluegrass region. 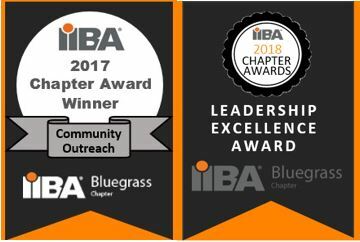 Nominations were made from the community knowing that inductees do not have to have an affiliation with the Bluegrass IIBA Chapter or IIBA; they just must to have made a personal contribution to the advancement and awareness of the value of business analysis here within the Bluegrass region. We will induct our fourth class of inductees for this prestigious recognition of individual effort.